Calf circumference is approx 25 cm. Very stylish and sleek black real leather knee high boots in excellent condition. Very soft good quality leather. boots size 5. Condition is Used. Dispatched with Royal Mail 2nd Class. Ladies Brown Faux Leather Knee High Boots Size 5 (UK), Size 38 (EU). 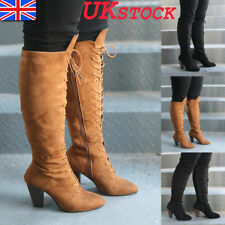 Ladies Brown Faux Leather Knee High Boots Size 5 (UK), Size 38 (EUR). This boots have only been tried on ONCE, no wear and tear anywhere（you can see from the pictures). New without BOX Description: --Style: Pull-up Zip. --colour: Brown. --Size: 5 (UK)/38(EUR). --Block Heel --Heel Height: 9cm/3.5 inches. --Calf Circumference; 35cm/13.8 inches. --Boots Height: 43cm/16.9 inches. Thank you for watching & Happy Purchasing! Black Knee High Boot Size 5. Dispatched with Royal Mail 2nd Class. womens black boots size 6 used. Condition is Used. Dispatched with Royal Mail 2nd Class. Black , plastic , shinny , knee high, boots with elastic panels on either side of the back seam. See picture. Side Zip I bought these in Debenhams about 2 years ago and I can not even remember if I have worn them, they are almost brand new. Very comfortable low heal Slight padded lining Would look nice in an evening out or to work as they have a shinny patent look. F un knee high boots. Zip up the inside. Tan colour in a suedette type material. 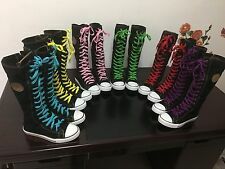 K NEE HIGH BOOTS. Quite a slim fit to the boots. Italian Made Black Knee High Boots -Size 6/39. Condition is Used. Dispatched with Royal Mail 2nd Class. GOOD QUALITY KNEE HIGH BOOTS WITH ZIPPER - White Patent. 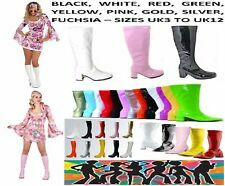 REALLY COOL KNEE HIGH FASHION BOOTS - SIZE 5 UK - Calf Size 32 cm. Never worn two-toned high heel knee high boots. Great for special occasions as well as casual wear. Thin inside linning will help to protect against the cold in winter. Good quality brown leather boots. Fleece lined. Slightly distressed finish. Has a few light surface marks. Wide calf fit. Please view all the pictures. Any q's please ask. Can combine uk p&p with my other listings but please message in advance. Thanks for browsing!